Cat and Estel just launched a fresh new German website, Viggo World, featuring Viggo Mortensen’s biography, filmography, books and CDs, plus the latest Viggo news. They would love to hear from Viggo’s fans. See this great article about Viggo Mortensen, Perceval Press, and Viggo’s next book, I Forget You for Ever (due in November), in the New York Times: link to article. Perceval Press has recently added several items: an original Viggo Mortensen T-shirt design reading “Impeach Remove Jail,” a new CD from Viggo and Buckhead entitled Intelligence Failure, and a 2nd printing of Twilight of Empire: Responses to Occupation that includes a new foreword by Howard Zinn. See Perceval Press for a new compilation CD “This and That” AND … reissue of T-shirts designed by Viggo Mortensen. 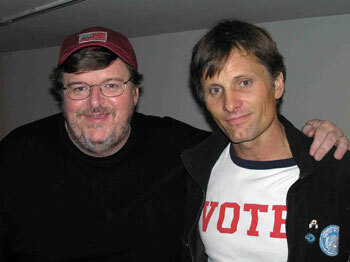 Viggo Mortensen was nominated for Favorite Male Action Movie Star in the People’s Choice Awards. Vote here! Women.com has a poll inviting women to pick the “hottest actor of them all” from a list of 12, including Johnny Depp, Orlando Bloom, and of course Viggo. Viggo is currently leading, with 32.47% of the vote. Depp is in 2nd with 26.66%. If you care, go vote!